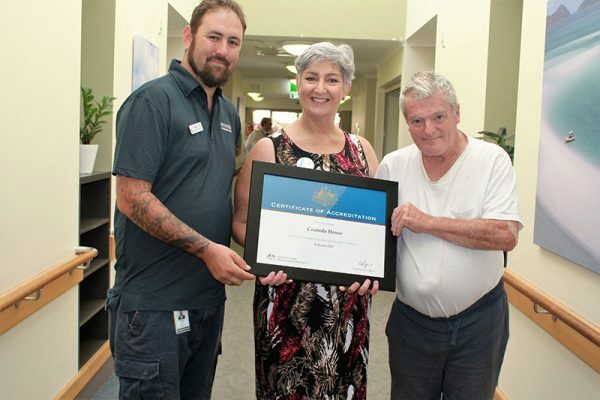 New Cooinda House Residential Aged Care Ambassador Ashleigh Lloyd, Metro North Hospital and Health Service Board Member Bonny Barry and Cooinda House resident Peter Tate celebrate Cooinda House being re-accredited by the Australian Aged Care Quality Agency. For Cooinda House resident Peter Tate it has been the small changes that have made all the difference to the care that is now provided to residents at the residential aged care facility in Redcliffe. Peter, who has lived at Cooinda House for the past four years, said it was important to understand that each of the residents has different needs. “The biggest difference for me over the past year is that staff now understand and respect that this is our home,” he said. Recently, Peter and other residents have provided their views and suggestions, and have also been involved in the planning for new improvements such as upgrades to amenities, facilities and the recruitment of aged care staff. Community and Oral Health Executive Director Tami Photinos said, as health care providers, it was vital that we strive to provide the best possible person-centred care. “In July 2017, the care provided at Cooinda House wasn’t ideal and as a result, we were sanctioned by the Commonwealth Department of Health,” Ms Photinos said. The improvements implemented have led to Cooinda House now being reaccredited until 2021 as a residential aged care provider by the Australian Aged Care Quality Agency. Ms Photinos said two new bariatric rooms have been established at Cooinda House equipped to cater for larger residents requiring more individualised and supportive care. “Cooinda House has also introduced our first Residential Aged Care Ambassador, which is believed to be a world first in the residential aged care setting, to help calm and de-escalate potential safety concerns,” she said. “The ambassador is an integral part of the care team, and is there to be a great companion, listener and calming influence for our frail and elderly residents, especially those with cognitive impairments such as dementia. Ms Photinos said staff, residents and families have reported feeling of increased safety and reduced anxiety with the ambassador in the facility, with the number of safety concerns falling quite significantly from around 50 each month in 2017 to now only a handful. Cooinda House is the home for 60 residents requiring high-level residential aged care services and is staffed by a multidisciplinary team including nursing, allied health, diversional and leisure therapists and support services. “Cooinda House has also enhanced its recreational programs for residents which is providing more themed meals and resident celebrations and events, and upgraded food services equipment to help provide more fresh and healthy food options for residents,” Ms Photinos said. Mr Tate said staff were encouraging residents to get outside more and had helped them create their own vegie gardens and improve and freshen up the facility. Cooinda House staff are accessing better training programs to help them specialise in caring for elderly people suffering from cognitive impairments, and ensure that they are constantly refreshing their skills.